The Broccoli, Chickpea and Rice Bake is one of our reader challenge recipes. Every now and again we like to issue a challenge to our readers - well, it's more to ourselves with our reader's participation. We ask readers to tell us their four favorite ingredients or foods and then we set out to pick one of the entries and use all four ingredients in one recipe. For this one, broccoli, chickpea, rice and garlic were the ingredient suggestions. Another one was strawberries, pineapple, almond milk and dark chocolate. We made a "Fruity, Almond Chocolate Flan". You can click the link to see that recipe. But this one posed a bit of a challenge. We decided to combine the four ingredients with a soup base and then bake it in the oven. 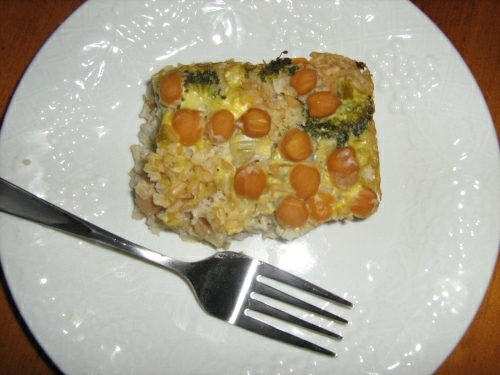 And the Broccoli, Chickpea and Rice Bake was the result. Be sure to read the recipe and note the little disclaimer or the afterthought at the end. All in all, not a bad effort though. First, saute the chopped garlic in the olive oil. cooked and simply needs to pick up the garlic. saucepan and heat until the soup and water combine thoroughly. they are just crisp tender and dark green. Spray a 9x9 baking pan or casserole dish with cooking spray. baking pan and spread evenly. Sprinkle on the seasoned salt. of celery soup and spread evenly. across the top layer in the pan. Cover with foil. Bake in a preheated oven for 40 minutes at 350 degrees. Uncover and allow to bake another 10 minutes. Goes well with fresh rye or whole grain bread and a fruit cup. 1 to 1 1/2 cups of shredded vegan cheddar atop the first layer of rice. Substitute cream of mushroom soup or cream of tomato soup.